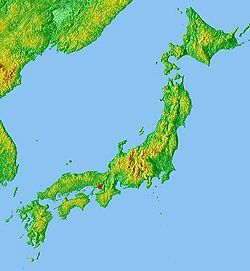 Osaka (大阪市, Ōsaka-shi) is a city in Japan, located at the mouth of the Yodo River on Osaka Bay, in the Kansai region of the main island of Honshū. 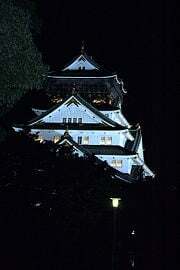 The city is the capital of Osaka Prefecture. Often dubbed the second city of Japan, Osaka was historically the commercial capital of Japan, and is the heart of Japan's second largest, and the world's ninth largest metropolitan area. While at night time the population ranks third place in the country at 2.6 million, in daytime it surges to 3.7 million, second only to Tokyo. The population of Osaka is considerably lower than its peak in the 1960s, and since the end of the 1990s, many major companies have moved their main offices to Tokyo. Recently the city has begun a program, to try to attract domestic and foreign in investment to the city. Osaka is home to the innovative Kansai Airport, built on an artificial island in Osaka Bay and designed to withstand typhoons and earthquakes. Osaka is traditionally considered the "nation's kitchen" (天下の台所　tenka no daidokoro) or the gourmet food capital of Japan. The city has a long history and is home to many ancient shrines and temples, and to the famous Osaka Castle, built by Toyotomi Hideyoshi in the late sixteenth century. Some of the earliest signs of habitation in the area of Osaka were found at the Morinomiya ruins (森の宮遺跡 ; Morinomiya iseki), with its shell mounds, including sea oyster shells and buried human skeletons from the fifth - sixth centuries B.C.E. It is believed that what is today the Uehonmachi area consisted of a peninsular land, with an inland sea in the east. During the Yayoi Period, permanent habitation on the plains grew as rice farming became popular. By the Kofun Period, Osaka had developed into a hub port, connecting the region to the western part of Japan. The large numbers, and the increasing size of, tomb mounds found in the plains of Osaka, are seen as evidence of a concentration of political power, leading to the formation of a state. In 645, Emperor Kōtoku built his palace (難波長柄豊碕宮 Naniwa-no-nagara-no-toyosaki-no-Miya) in Osaka, making this area the capital (Naniwa-kyō). The area which now comprises Osaka city was called Naniwa, a name which still exists as the names of districts in central Osaka as Naniwa (浪速) and Namba (難波). Though the capital was moved to Asuka (in Nara Prefecture today) in 655, Naniwa has always remained a vital connection, by land and sea, between Yamato (modern day Nara Prefecture), Korea, and China. In 744, Naniwa was once again briefly named capital by Emperor Shōmu, but the Imperial Court moved back to Heijō-kyō (now Nara) in 745. The city’s function as a sea port function was gradually taken over by neighboring lands by the end of Nara Period, but it remained a lively transit center for river, channel and land transportation between Heian-kyō (Kyoto today) and other destinations. In 1496, the Jōdo Shinshū Buddhist sect set up their headquarters, the heavily fortified Ishiyama Hongan-ji, on top of the ruins of the old Naniwa imperial palace. In 1570, Oda Nobunaga started a siege of the temple that lasted for ten years. The monks finally surrendered in 1580, the temple was razed, and Toyotomi Hideyoshi took the site for his own castle, Osaka Castle. Osaka was for a long time Japan's most important economic center, with a large percentage of the population belonging to the merchant class. Over the course of the Edo period (1603–1867), Osaka grew into one of Japan's major cities and returned to its ancient role as a lively and important port. Developing in parallel with the urban culture of Kyoto and Edo, Osaka also featured bunraku and grand kabuki productions, pleasure quarters, and a lively artistic community. The modern city was initially designated in 1889 by government ordinance, starting with an area of only 15 km², overlapping today's Chūō and Nishi wards. Later the city went through three major expansions to reach its current size of 222 km². Osaka literally means "Large Hill." It is unclear when the name Ōsaka gained prominence over Naniwa, but the oldest usage of the name dates back to 1496, in a text written about the foundation of the Ishiyama Hongan-ji. At this time, the second kanji was "坂," instead of the "阪" used today. In the beginning of Meiji Era, the government changed the second kanji 坂 to 阪 because the previous one could, if the radicals were read separately, be interpreted as "(will) return to soil" (土に返る), which seemed inauspicious. This remains the official spelling today, though the old one is still in very limited use to emphasize history. The city of Osaka has its west side open to Osaka Bay. It is otherwise completely surrounded by more than ten smaller cities, all of them in Osaka Prefecture, with one exception: the city of Amagasaki, belonging to Hyōgo Prefecture, in the north-west. The city occupies a larger area (about 12 percent) than any other city or district within Osaka Prefecture. The two most crowded centers of the city of Osaka are often called by their synonyms: Kita (キタ, lit. north) and Minami (ミナミ, lit. south). Kita is roughly the area including or surrounding the business and retail district of Umeda. Minami is home to the Namba, Shinsaibashi and Dōtonbori shopping districts. The entertainment area around Dōtonbori Bridge, with its famous giant mechanical crab, Triangle Park and Amerikamura ("America Village") are in Minami. The traditional business district, including the courts and regional headquarters of major banks, is primarily located in Yodoyabashi and Honmachi, between Kita and Minami. 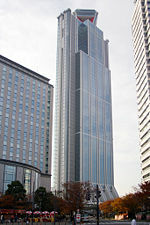 The newer business district is the OBP, Osaka Business Park, located in the neighborhood of Osaka Castle. Business districts have also formed around the city's secondary rail termini, such as Tennoji Station and Kyobashi Station. The proverbial adage, “The 808 bridges of Naniwa,” was a famous expression for awe and wonder in old Japan. “Naniwa” was the ancient name of Osaka and “808” was a large number that in Japan symbolizes the concept “uncountable”. Osaka is the heart of Japan's second largest, and the world's ninth largest metropolitan area of Osaka-Kobe-Kyoto, which has a population is 19,220,000. Osaka holds first place in Japan for its day to night population ratio of 141%,  a clear statement of Osaka's commercial character. While at night time the population ranks third place in the country at 2.6 million, in daytime it surges to 3.7 million, second only after Tokyo. According to the 2005 Population Census of Japan, the city of Osaka has a population of 2,628,811, which is an increase of 30,037, or 1.2%, over the previous census of 2000, but much lower than its peak of over 3 million in the sixties. Many other cities in the Kinki area have populations far below their peaks. The population density in 2005 was 11,836 persons per km². The number of households was 1,242,489, with an average of approximately 2.1 members per household. Recently, that has risen to 2.31 members. There were 99,775 Registered Foreigners, with the two largest groups being Korean (71,015 people) and Chinese (11,848 people). The largest community of registered Zainichi Korean is the 27,466 people residing in Ikuno-ward, where the so-called “Korean town,” Tsuruhashi, is located. The commonly spoken dialect of this area is Osaka-ben. An example, among many other particularities that characterizes Osaka-ben, is the use of the suffix hen instead of nai in the negative of verbs. The gross city product of the city of Osaka for fiscal 2004 was ¥21.3 trillion, with an increase of 1.2 percent over previous year. This represents about 55 percent of Osaka Prefecture, or 26.5 percent of the Kinki region. As of 2004, commerce, services and manufacturing are the three major industries, with respective shares of 30, 26 and 11 percent of total industry. The per capita income was about ¥3.3 million, 10 percent higher than that of Osaka Prefecture. Kansai is the geographical term for the area of western Honshū surrounding Osaka. The airport is linked by a bus and train service into the center of the city and major suburbs. Osaka International Airport, laid over the border between the cities of Itami and Toyonaka, still houses most of the domestic service from the metropolitan region. The Osaka Municipal Subway system is Osaka's extensive rapid transit system. The system ranks 8th in the world in annual passenger ridership, serving over 912 million people annually. Besides this, there is a network of both JR and private lines connecting the suburbs of the city, and Osaka to its neighbors. Keihan and Hankyu lines connect to Kyoto, Hanshin and Hankyu lines connect to Kobe, the Kintetsu line connects to Nara and Nagoya, and the Nankai line to Wakayama. Museum of Oriental Ceramics, Osaka  Founded in 1982. It houses 2000 pieces of ceramics. It also features a natural-light gallery for its Korean celadon pottery. The Osaka Shiki Theater  - Shiki Theatre Company. Osaka is traditionally considered the "nation's kitchen" (天下の台所　tenka no daidokoro) or the gourmet food capital of Japan. Osaka’s reputation as a culinary mecca is supported by the saying "Dress (in kimonos) 'til you drop in Kyoto, eat 'til you drop in Osaka" (京の着倒れ、大阪の食い倒れ). Osaka regional cuisine includes okonomiyaki (pan-fried batter cake), takoyaki (octopus dumplings), udon (a noodle dish), as well as regional sushi and other traditional Japanese foods. Osaka Aquarium Kaiyukan (海遊館)—an aquarium located in Osaka Bay, containing 35,000 aquatic animals in 14 tanks, the largest of which holds 5,400 tons of water and houses a variety of sea animals including whale sharks. This tank is the world's second largest aquarium tank, behind the Georgia Aquarium, whose largest tank holds approximately 29,000 tons of water. Shin-Umeda City - an innovative structure with a floating garden observatory 170 m above the ground which offers a spectacular 360-degree panoramic view of Osaka. Thestructure also houses an underground mall with restaurants and a Zen garden; it is built in the early Showa style of the 1920s. Nakanoshima Park: In the vicinity of the City Hall. Osaka Castle Park: About 106 ha. Holds: Osaka-jō Hall, a Japanese apricot garden, and various amusements. Tennōji Park : About 28 ha. Holds: Tennōji Zoo, an art museum (established by contribution from Sumitomo family in 1936) and a japanese garden, Keitaku-en (慶沢園). Keitaku-en was constructed in 1908 by Jihei Ogawa (小川治兵衛), an illustrious gardener in Japan. This was one of the Sumitomo family's gardens until 1921. Nagai Park The IAAF World Championships in Athletics are currently being held at Nagai Stadium, located in this park. Tsurumi-Ryokuchi Park: held a flower expo in 1990. Shitennō-ji The oldest Buddhist temple in Japan, established in 593 C.E. by Prince Shōtoku. Sumiyoshi Taisha One of the oldest Shinto shrines; many people go and worship at this shrine on the new year day. It is said this shrine was built in 211 C.E. Osaka has a vast number of shopping areas to choose from, including malls and a large number of shopping arcades, or roofed shopping streets. Osaka has the longest shopping arcade in Japan. Tenjinbashi-suji stretches from the road approaching the Tenman-gu shrine and continues for 2.6 km, going north to south, and has all types of stores including commodities, clothing and catering outlets on both sides of the arcade. Other key shopping areas are Den Den Town, the electronic and manga/anime district resembles Tokyo’s Akihbara; and the Umeda district, which has the Hankyu Sanbangai shopping mall and Yodobashi Camera, a vast range of fashion stores, restaurants and a Shonen Jump store. Public elementary and junior high schools in Osaka are operated by the city of Osaka. Its supervisory organization on educational matters is Osaka City Board of Education . Public high schools are operated by Osaka Prefectural Board of Education. A large number of universities were once located in Osaka city center, but because of growing campuses and the need for larger area, many universities chose to move to the suburbs. Osaka Prefecture's most prestigious university, Osaka University, is located in the nearby Suita. Osaka also has a number of sister ports, and several business partner cities. ↑ 1.0 1.1 1.2 1.3 Historical overview. Retrieved March 19, 2008. ↑ More About Osaka, Osaka City Government. Osaka City. Retrieved December 2, 2007. ↑ Population Census: I Daytime Population. Statistics Bureau, Ministry of Internal Affairs and Communications. Retrieved December 2, 2007. ↑ Osaka and the World, the official website of the Osaka. Osaka City. Retrieved December 2, 2007. Hsu, Robert C. 1999. The MIT encyclopedia of the Japanese economy. Cambridge, MA: MIT Press. ISBN 0262082802. Laquian, Aprodicio A. 2005. Beyond metropolis: the planning and governance of Asia's mega-urban regions. Washington, DC: Woodrow Wilson Center Press. ISBN 0801881765. Philadelphia Museum of Art, Roger S. Keyes, and Keiko Mizushima. 1973. The theatrical world of Osaka prints; a collection of eighteenth and nineteenth century Japanese woodblock prints in the Philadelphia Museum of Art. Stone, Peter G. and Philippe G. Planel. 1999. The constructed past: experimental archaeology, education, and the public. London, UK: Routledge in association with English Heritage. ISBN 0415117682. A collection of articles about the Kamagasaki area of Osaka on libcom.org. This page was last modified on 5 January 2019, at 22:32.